Chef Hong Thaimee, chef/owner of several Thai restaurants in New York City, now has a location at 570 Lex, a popular food court in Midtown. After a stint at Jean Georges' Spice Market and Perry Street, Thaimee opened her first restaurant in the East Village focusing on Thai flavors. 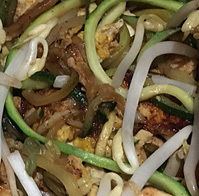 The menu at 570 Lex features Pad Thai with rice or zucchini noodles (choice of chicken, shrimp or tofu), Curry over Rice (with veggies or chicken), Chicken Wings (in a tangy, spicy sauce), Fried Rice (with choice of protein), and classic Papaya Salad. Drinks, like Thai Iced Tea, are also available.